The Edgewater’s pier has always been the place to be since the hotel’s opening back in 1948. If you’re coming by water, simply pull up, dock and enjoy a casual, leisurely meal at The Boathouse, which serves warm-weather fare like cheese curds made with Milwaukee’s Clock Shadow Creamery cheese, a simple Boathouse Burger or the ubiquitous Friday-night favorite, the fish fry. Their cocktail menu leans in the craft direction and plenty of local brews (Ale Asylum, Karben4, Potosi) can be had, all while enjoying the breeze off of the lake. INSIDER TIP: The Edgewater has a custom Babcock ice cream flavor of their own— caramel corn. Get a scoop after dinner! Known for its laid-back atmosphere, tropical vibe and lakefront tiki bar, this family-owned Lake Waubesa eatery is a must to visit by boat or land. The no-fuss menu features wraps, sandwiches, burgers and appetizers—like the fabulous Shrimp Christy, wrapped in pepperjack cheese and bacon, served with chips and pico de gallo. INSIDER TIP: The second-floor deck overlooking the water is a prime spot to catch the water action and soak in warm weather. 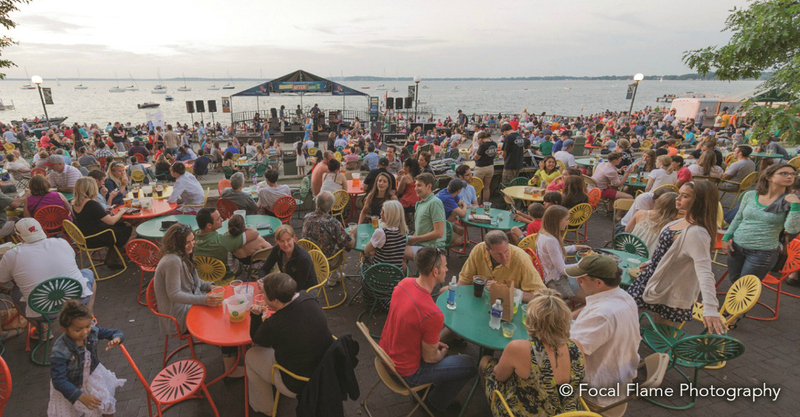 The Terrace celebrates its 89th season this year as one of the best places to be in Madison in the summertime. And, with the improvements made to the Terrace in 2016, it boasts even more seating, better sight lines and most importantly, a better Brat Stand. Grab a brat, beer and a scoop of famous Babcock ice cream (made on UW–Madison’s campus) and settle in on a Sunburst chair to chat with friends, listen to some live music or just enjoy the view. INSIDER TIP: The trademark Sunburst chairs are in John Deere green, Allis Chalmers orange and yellow to celebrate spring and fall—the seasons students most associate with the Terrace. 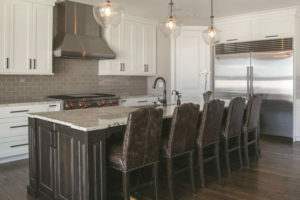 This 57-year-old family business traces its roots back to the (now-closed) Nibble Nook, an eightseat hamburger restaurant on East Washington Avenue that was purchased by Betty and Bill von Rutenberg in 1961. The family now has three waterfront restaurants (Captain Bill’s, Mariner’s Inn and Nau-Ti-Gal) and Betty Lou Cruises that sail on both Lake Monona and Lake Mendota. The nautically-inspired restaurants all focus on seafood and all offer stunning views of Lake Mendota. INSIDER TIP: A seat on Captain Bill’s deck is one of the best in the house. One of the most exquisitely appointed restaurants in Madison open since 2006, Sardine is a beloved institution, perched on the shores of Lake Monona. Once an icehouse and tobacco warehouse, the vintage bistro aesthetic carries on beautifully with wood beams and subway tile throughout. The French-inspired seasonal menu focuses heavily on meat and seafood—like the seared salmon, cassoulet and of course, moules frites. INSIDER TIP: The brunch menu is one of the most divine in the city, with delicious options (omelets, salads and entrees, like crab, bacon and shrimp cakes), great cocktails—and, if you can sit on their deck—a gorgeous lake view to boot. From the industrial design touches (Edison bulb pendants, corrugated metal accents and pipe shelving) to the spacious wraparound bar, this sophisticated restaurant is a welcome waterfront option on Lake Waubesa. Have a seat on the deck outfitted with twinkling café lights and order up one of 30 daily rotating selections of draft beer from local favorites like Vintage Brewing, New Glarus and Wisconsin Brewing Company. INSIDER TIP: Enjoy brunch on Sundays with a tinge of southern influence—like in the deep-fried pecan chicken and French toast or the chimichurri breakfast tacos.